The recipe I’m featuring today is indeed from the one and only, Martha Stewart. Martha sure made it hard for me to choose which recipe to try out. I think any choice would have been a good one but I’m satisfied with my pick. And who’s to say I can’t try them all? Before getting in over our heads with kitchen torches and the like, we settled on skillet corn, edamame, and tomatoes with basil oil. So so so good people. I’m telling you it’s the perfect summer dish. We chose to pair it with grilled salmon but really anything will do. The flavors just worked really well together and also, those are all my favorite foods. So if you’re feeling up to it this weekend, try out my recommendation. Maybe even pick up the magazine if you feel so inclined. You won’t regret it. You can cook this dish on the stove or on a grill heated to medium-high. Bring a small pot of water to a boil. Add basil; cook 10 seconds. Transfer basil to a bowl of ice water, then drain, and squeeze 1/2 teaspoon salt in a blender or food processor until smooth. Heat remaining oil in a skillet over medium-high heat. Add scallions and garlic; cook until fragrant, about 30 seconds. Add corn, edamame, and remaining salt. Cook, stirring, until starting to caramelize, about 10 minutes (reduce heat to medium if overbrowning.) Add tomatoes and vinegar; cook until tomatoes start to collapse, about 8 minutes. Drizzle basil oil on vegetables and stir. Serve immediately. Now for a dish I did actually make: a breakfast sandwich. Of course this is extremely simple – had to be if I made it. 1. Pour olive oil in a skillet. Fry egg. 2. Toast the grain of your choice (bagel, english muffin, french bread, etc.) I used a whole grain english muffin. 3. 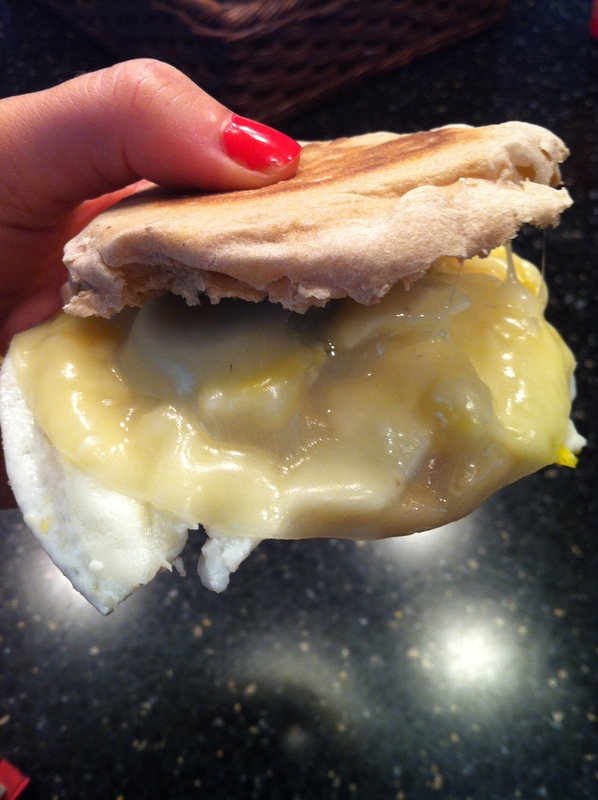 Add egg, cheese, and jalepenos to english muffin. Toast for another 30 sec to 1 minute. Honestly, you could make this so many different ways it’s ridiculous. Choose swiss or pepper jack cheese instead of provolone. Add or substitute green & red peppers, mushrooms, or tomato. Even add some sausage or bacon if you wish! This looks like a great combination of flavors!